From 1994-2008, Cashiers Du Cinemart was a fanzine featuring wildly opinionated movie reviews and retrospects, as well as interviews, with everyone from Crispin Glover to cast members of seldom-seen 70s blaxploitation films. 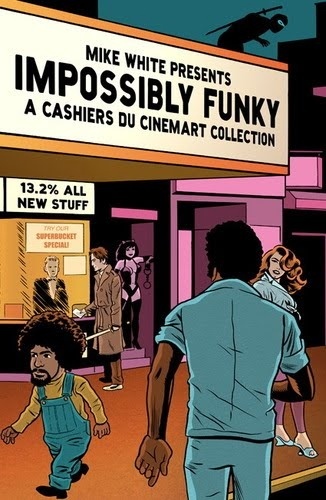 Impossibly Funky collects some of the fanzine’s finest moments, and features introductions from exploitation film guru Herschell Gordon Lewis to the founder of Film Threat, Chris Gore. Author Mike White is perhaps best known for calling Quentin Tarantino out for certain “similarities” between the 1989 Hong Kong movie, City on Fire, and his own film, Reservoir Dogs. White even made a short feature, Who Do You Think You’re Fooling?, which shows (side-by-side) shots from both films, calling Tarantino’s motives into question. The opening chapters of the book deal with this whole saga, and while I had seen White’s film online, there’s plenty more here for those interested in this on-going celluloid grapple. Among my favorite sections were Mike Thompson’s look at the original script for the Nicolas Cage film 8mm, Mike White’s section on Alien 3, White’s interview with Canadian cult film director Guy Maddin, and of course, the huge section dedicated to the 1975 blaxploitation classic, Black Shampoo, which features an overview of the cast, interviews with the director and a few stars, and an interesting story on how Mike and his friends became addicted to it (and still hold annual viewings). While I haven’t mentioned even half of what’s on display here (Star Wars fans will get a kick out of the small section dedicated to it), Impossibly Funky looks at films through the eyes of super-geek film fans, and while (at times) things get a bit obsessive (I mean, what film geek doesn’t get obsessive when talking films? ), film fans will not be bored, even if a topic being discussed isn’t of particular interest. A fun. informative, and smart book to garnish any film freaks’ book shelf.